There are certain comfort foods that have no replacement. If you grew up with a parent from New Orleans, as one of the 2frugalfoodies did, those cajun flavors are really hard to beat. On a cold December day, when it’s raining and cloudy and cold, could there possibly be anything better to come home to than a hot bowl of gumbo? 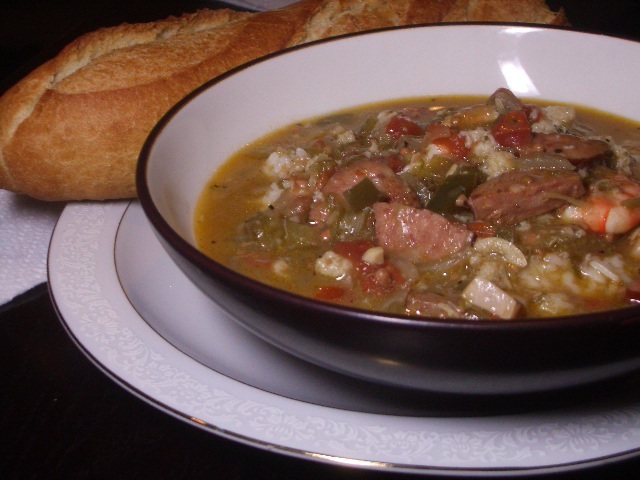 With this recipe, you can start your gumbo tradition today, regardless of your Cajun or non-Cajun heritage. The recipe may be time-consuming and somewhat costly, but we guarantee you’ll love it. One of the best things about making gumbo for 2 is that you’ll have leftovers for weeks….and, when you freeze the leftovers, the flavors meld more and more and it just gets better and better and better. Just keep cooking a new pot of rice each time and keep enjoying it!